Hello everyone. In a month, I will be taking on a project. My dad has a laptop that last year I very quickly and sloppily installed Linux Mint 17.3 MATE on. It ran fine, but he doesn't understand it at all, stares at the screen for 5-10 minutes, gets frustrated and shuts it off. I have been debating between installing Peppermint 7 or elementary OS 0.4 Loki on it but am strongly leaning toward Pepp 7 as its an older laptop and my father is impatient and will NOT wait on it. Here's the thing, he lives 400 miles away from me, and has very limited data each month (like 2GB he shares with my stepmom). I have 5 days in early June to bring the laptop home with me and have it 100% amazing and ready to go so that when he turns it on, everything just works. My father has limited computer knowledge, and as an example he has asked me numerous times how to copy/paste things. Thats how "user friendly" I have to make Peppermint 7. His needs are simple. He said "I want to browse the internet, facebook messenger, gmail, play some games, play/rip/burn cds, play DVDs. Make it idiot proof and something I can't F up." I have an idea in the direction I want to go, but am looking for any advice on this so his computer is setup perfect when he turns it on. I need advice on Games as well, as he is interested in games that I know nothing about. He said his favorites are: Chess, Mahjong, Sudoku, Solitaire & Freecell. As far as the CD thing, I was thinking Rhythmbox might be the most user friendly, but if you have other thoughts there, let me know. VLC for DVDs. I'm also wanting to create little tutorials with screenshots for him on how to do simple things (the things most of us do automatically). I'm not sure what the best way to go about that is though. Perhaps create static HTML documents or something?? Any ideas there would be appreciated as well. I was also going to ask about kernels. Currently on all of my laptops running Pepp7, I have the 4.10 kernel running and doing just fine. Considering his laptop probably will not be updated for another year, should I do that with his as well, or leave it with the default 4.4 kernel? Sorry for being so long winded, its just turning into a larger project than I originally thought. I look forward to any and all advice that you guys have. Thanks. I look after my elderly father's computer. In a nutshell, if your dad doesn't carry out basic tasks, i.e run the "updates". It becomes pointless. His needs are gmail, amazon, general internet browsing, word processor and spreadsheet, music and the odd dvd use. He can be ham-fisted, so use a second panel (set as deskbar and intelligently hide) to hold the icon launchers, more robust than plank or cairo. Osmo for birthday/appointments - (needs tweaking i.e colour taste, default settings looks drab). Pysol card games (his must have game). Linux games are subjective, none appeal to me. Hide synaptic and software centre, any tool, i.e gpart if you installed it. Less for them to play with and destroy the system. I'm considering pinning the kernel on dad's computer, this becomes one less task, i.e rebooting after kernel update. Remote login - due to distance, carry out routine tidy up, run updates fix minor issues. I too like cavy's suggestion of using remote logins to perform the system maintenance work and hiding (or setting permission restrictions on) critical software that could destroy the setup (e.g. synaptic, gparted, software center, and such). Just have him inform you whenever he might wish to have something new installed. Depending on the bandwidth requirements, many of the games you mentioned can be set up (or are already set up in the standard installation) as ICE apps. If he really is too restricted to play online then just install games from the repositories. For an installed chess game: GnuChess with xboard is a pretty good challenge. You can set up scripts for several variations (where he plays, e.g. white or black, with different time limits, such as blitz, 30 min or longer time limits, etc) and have them as desktop icons with appropriate names so he knows which he is starting. If he can play online, however, the best I've found is at lichess.org -- set up an account for him and (if he really likes to play) he'll love it. Install clipit .. for a clipboard manager, so it works/behaves more like Windows. so you can remote in if necessary. As far as kernels go it's your choice. But there's equally something to be said for going for a kernel that won't get automagically updated (such as your 4.10) on a system where stability is important .. so your call. Personally I use VLC for ALL my media, but if you want a "music player", I'd second Clementine. Thanks for all the advice guys, its helping to point me in the right direction. 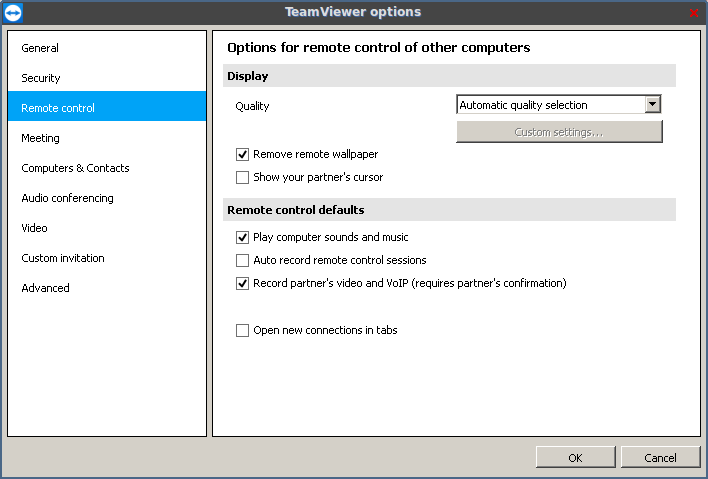 I am curious though about teamviewer though. Does it use a lot of data? He has like 2GB a month wifi that he shares with my stepmom. Mine is unlimited. If it doesn't take much data that would make things WAY easier on me. I plan on making a dry run here in a couple weeks on my old project laptop (I just use it to test different distros) and install everything as if it was his computer. I will probably install all of the recommended games (although I have no idea myself how to play them) and software and test it out first. I really have to look more into TeamViewer though, I think that could make things way easier. I really couldn't tell you how much bandwidth TeamViewer uses when in use, but I can tell you it should use non when it's not been manually started by your dad, and it's only going to be started for emergencies right ? .. you can change the settings in Extras > Options which **might** save bandwidth. But I have no idea if or how much bandwidth this saves.